Hundreds of Christians protesting after a Muslim mob burned their homes have clashed with police today. Dozens of homes were set alight in eastern stan after a non-Muslim was accused of making offensive comments about Islam's Prophet Mohammed, police said. Officers have arrested 150 people accused of starting the fires. It came as Christian demonstrators blocked a main highway in Lahore and police fired tear gas shells to disperse the protesters, who demanded assistance from the government. 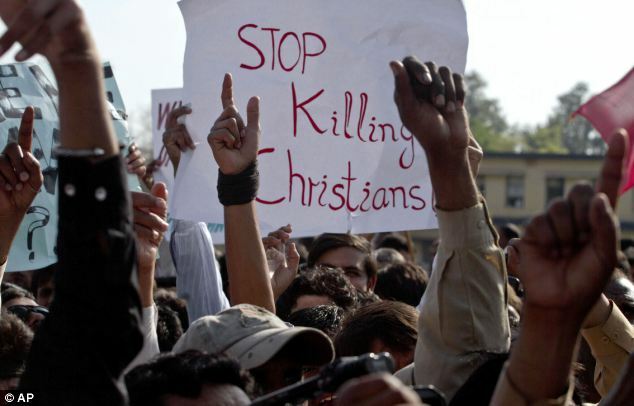 Christians across the country rallied against the incident, but the main demonstrations were in Lahore, the southern port city of Karachi, the capital, Islamabad, and the adjoining city of Rawalpindi. Government spokesman Pervaiz Rasheed promised it would help hem rebuild their houses, but the Christians expressed dissatisfaction with the way the government was handling the incident. 'I have been robbed of all of my life's savings,' Yousuf Masih said, standing close to his burned house. He said the government's announcement that it would give 200,000 rupees (£1,300) compensation to each family was a joke. Protesters damaged several vehicles, uprooted a fence along the road and burned an electricity generator. Seven policemen were injured when the protesters pelted them with stones. The incident began on Friday after a Muslim accused a Christian man of blasphemy - an offence that in stan is punished by life in prison or death. 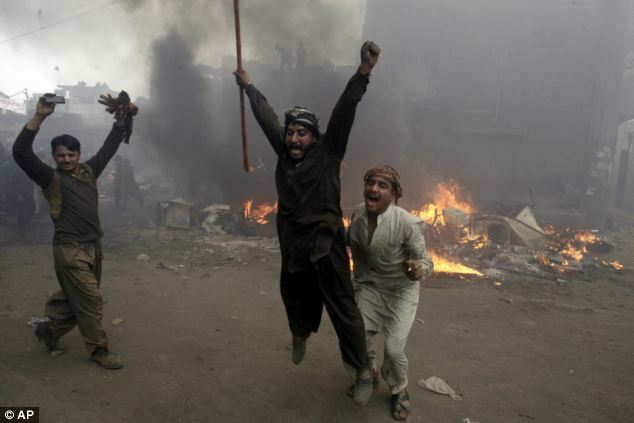 Yesterday, a mob of angry Muslims rampaged through the Christian neighbourhood, burning about 170 houses. The Christian man is in police custody pending an investigation into the allegations. Those who rioted are being investigated for alleged arson, robbery, theft, and terrorism, said police officer Abdur Rehman. In Karachi, more than 1,000 protesters blocked a road in a main market and damaged about 25 vehicles, said police officer Ali Raza. Akram Gill, a bishop in the Lahore Christian community, said the incident had more to do with personal enmity between two men - one Christian and one Muslim - than blasphemy. He said the men got into a brawl after drinking late one night, and in the morning the Muslim man made up the blasphemy story as payback. Such accusations of blasphemy in stan can prompt huge crowds to take the law into their own hands. Once an accusation is made it is difficult to reverse, partly because law enforcement officials and politicians do not want to be seen as being soft on blasphemers. According to Human Rights Watch, there are at least 16 people on death row for blasphemy and another 20 are serving life sentences. Last year, there was a rare reversal of a blasphemy case. A teenage Christian girl with suspected mental disabilities was accused of burning pages of the Koran. But she was later released after a huge domestic and international outcry about her treatment. A local cleric where she lived was arrested and accused of planting the pages in her bag to incriminate her, a rare example of the accuser facing legal consequences. However, he was later freed on bail.